The festival was last weekend. It was a gorgeous, sunny day. We rode bikes. Ate some food. Drank some wine. And some beer. And some water. Looked at art. Bought art. Listened to music. Had a great time. Click here and you can see a few more pics. 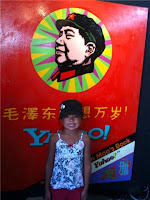 The artist, Pop Zhau, who paints the Mao paintings wasn't at the festival in 2008. He was commissioned by the Chinese Olympic committee to do work there. But he was back this year. Here is Elli in front of the same painting we saw in 2007. Weird.